A personality test aims to assess aspects of a person's character that remain stable across situations, referred to as their personality. Personality is generally understood as a collection of emotional, thought, and behavioral patterns unique to a person, that is consistent over time. Generally, personality tests assess common characteristics for large segments of the population, describing people according to a number of dimensions or traits, rather than attempting to describe every detail of any particular individual's personality. A variety of methods have been developed to assess personality differences and characteristics, based on various approaches to the nature of personality. While none is a complete description of human personality, many tests have proven useful in specific applications, such as interviewing prospective employees, through focusing on the attributes important for the particular situation. Through this use, a good fit can be found between an individual and what they will be called on to accomplish, thus benefiting both the individual and the whole purpose that they are serving. Greek philosopher Hippocrates recorded the first known personality model basing his four "types" on the amount of body fluids, or "humors," an individual possessed. Greek philosopher Hippocrates recorded the first known personality model basing his four "types" on the amount of body fluids, or "humors," an individual possessed. Greek physician Galen expounded upon Hippocrates' theory based on the four basic body fluids (humors): blood, phlegm, black bile, and yellow bile. 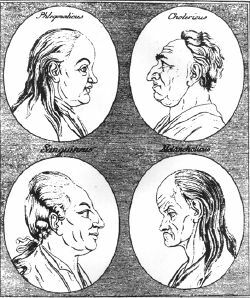 According to their relative predominance in an individual, they would produce, respectively, temperaments designated sanguine (warm, pleasant), phlegmatic (slow-moving, apathetic), melancholic (depressed, sad), and choleric (quick to react, hot tempered). German philosopher Immanuel Kant popularized these ideas by organizing the constructs along the two axes of feelings and activity. The advent of the field of psychology led to more formalized categories and tests. For example, Wilhelm Wundt proposed that the four temperaments fall along the axes of changeability and emotionality. As the field of psychology developed so did both theories of personality and the methods to assess personality differences. A wide range of personality tests are available for use, for a variety of purposes, in different situations. The first personality test was the Woodworth Personal Data Sheet first used in 1919. It was designed to help the United States Army screen out recruits who might be susceptible to shell shock. A projective test is one in which the person is asked to respond to ambiguous stimuli in order to reveal hidden emotions and internal conflicts. This differs from an "objective test," in which responses are analyzed according to a universal standard, such as in a multiple choice questionnaire. The two most well-known and often used projective tests are the Rorschach inkblot test and the Thematic Apperception Test (TAT). The Rorschach inkblot test, named after its inventor Hermann Rorschach, was introduced in 1921, as a way to determine a person's personality by their interpretation of abstract inkblots. The Thematic Apperception Test (TAT) was commissioned by the Office of Strategic Services (O.S.S.) in the 1930s, to identify personalities that might be susceptible to being turned by enemy intelligence. American psychologists Henry Murray and Christiana D. Morgan at Harvard were responsible for developing the TAT test. They explored the underlying dynamics of personality, such as internal conflicts, dominant drives and interests, and motives. Specifically, the test assesses motives, including needs for achievement, power, intimacy, and problem-solving abilities. What dialogue might be carried on between characters? How might the "story" continue after the picture shown? For this reason, the TAT is also known as the "picture interpretation technique." Each story created by a subject is carefully analyzed to uncover underlying needs, attitudes, and patterns of reaction. Subjects can respond orally or in writing and there are specific subsets of pictures for boys, girls, men, and women. The TAT is a projective test in that, like the Rorschach inkblot test, its assessment of the subject is based on what he or she projects onto the ambiguous images. After World War II, the TAT was adopted more broadly by psychoanalysts and clinicians to evaluate emotionally disturbed patients. Later, in the 1970s, the Human Potential Movement encouraged psychologists to use the TAT to help their clients understand themselves better and stimulate personal growth. Today, the TAT is widely used as a tool for research in areas of psychology such as dreams, fantasies, mate selection, and what motivates people to choose their occupation. Sometimes it is used in a psychiatric context to assess disordered thinking, in forensic examinations to evaluate crime suspects or to screen candidates for high-stress occupations. The TAT has been criticized for a number of reasons. It is not administered in a standardized way, and because it is challenging to standardize interpretation of the stories it produces. A scoring system for analysis was created by David McClelland in an attempt to introduce more rigor. The 31 standard pictures have been criticized as negative in tone and therefore tending to limit the range of personality characteristics that the TAT can explore. Research has shown that factors including race, gender, and social class of both examiners and subjects influence the stories told and how they are interpreted. The Minnesota Multiphasic Personality Inventory (MMPI) was published in 1942 as a way to aid in assessing psychopathology in a clinical setting. It is the most frequently used personality test in the mental health field. This assessment was designed to help identify personal, social, and behavioral problems in psychiatric patients. The results from this test provide relevant information to aid in problem identification, diagnosis, and treatment planning for patients. The test has also been used for job screening and other non-clinical assessments, which is considered controversial and is in some cases illegal. The original MMPI was developed at the University of Minnesota Hospitals and first published in 1942. The original authors of the MMPI were Starke R. Hathaway, PhD, and J. C. McKinley, MD. The MMPI is copyrighted and is a trademark of the University of Minnesota. Clinicians must pay a fee each time it is administered. The standardized version for adults 18 and over, the MMPI-2, was released in 1989, with a subsequent revision of certain test elements in early 2001. The MMPI-2 has 567 items, or questions, and takes approximately 60 to 90 minutes to complete. There is a short form of the test that is comprised of the first 370 items on the long-form MMPI-2. There is also a version of the inventory for adolescents aged 14 to 18, the MMPI-A. Other personality tests, like the Rorschach inkblot test and Myers-Briggs Type Indicator, have come under fire more often than MMPI. Still, critics have raised issues about the ethics and validity of administering MMPI, especially for non-clinical uses. By the 1960s, the MMPI was being given by companies to employees and applicants as often as to psychiatric patients. Sociologist William H. Whyte was among many who saw the tests as helping to create and perpetuate the oppressive "groupthink" of mid-twentieth century corporate capitalism. In 1965 the Senate Subcommittee on Constitutional Rights of the Committee on the Judiciary, chaired by Senator Sam Ervin, and the House Special Subcommittee on Invasion of Privacy of the Committee on Government Operations, chaired by Representative Cornelius E. Gallagher, held hearings to determine whether the questions asked on psychological tests used by the Federal Government were an unjustified invasion of the respondent’s psyche and private life. The Subcommittees also investigated the validity of these tests and the due process issues involved in test administration. The reactions of the press and public were very critical of the types of questions asked on these psychological tests. Numerous successful lawsuits have argued that giving the test to job applicants is an invasion of privacy, and that there is no evidence linking test results to job performance. Others have accused that MMPI can "overpathologize" certain demographic groups, notably teenagers and non-white test takers. The Myers-Briggs Type Indicator (MBTI) was designed to assist a person in identifying their personality preferences. It was developed by Katharine Cook Briggs and her daughter Isabel Briggs Myers during World War II, and follows from the theories of Carl Jung as laid out in his work Psychological Types. The registered trademark rights in the phrase and its acronym have been assigned from the publisher of the test, Consulting Psychologists Press Inc., to the Myers-Briggs Type Indicator Trust. The test is frequently used in the areas of pedagogy, group dynamics, employee training, leadership training, marriage counseling, and personal development, although scientific skeptics and academic psychologists have subjected it to considerable criticism in research literature. Artisans (SPs) seek freedom to act and are concerned with their ability to make an impact on people or situations. Their greatest strength is tactical intelligence, which means that they excel at acting, composing, producing, and motivating. Guardians (SJs) seek membership or belonging and are concerned with responsibility and duty. Their greatest strength is logistical intelligence, which means that they excel at organizing, facilitating, checking, and supporting. Idealists (NFs) seek meaning and significance and are concerned with finding their own unique identity. Their greatest strength is diplomatic intelligence, which means that they excel at clarifying, unifying, individualizing, and inspiring. Rationals (NTs) seek mastery and self-control and are concerned with their own knowledge and competence. Their greatest strength is strategic intelligence, which means that they excel at engineering, conceptualizing, theorizing, and coordinating. Keirsey, David. 1998. Please Understand Me II: Temperament, Character, Intelligence. Prometheus Nemesis Book Co. ISBN 1885705026. Another personality assessment similar to the MBTI is called the Enneagram. The term "enneagram" derives from the Greek words ennea (nine) and gramma (something written or drawn). The figure can also be called an "enneagon." The usual form of the Enneagram figure consists of a circle with nine points on its circumference equally spaced with one at the top and numbered clockwise from 1 to 9 starting with 1 at the point one position clockwise from the top-most point and ending with 9 at the top-most point. The Enneagram figure's most well-known use is in indicating a dynamic model of nine distinct yet interconnected psychological types (usually called "personality types" or "character types"). These types can be understood as unconsciously developing from nine distinct archetypal patterns. It is sometimes speculated that forms of the Enneagram typology can be found in ancient sources, especially within the Sufi spiritual tradition, or that the Enneagram figure is possibly a variant of the Chaldean Seal from the times of Pythagoras. The Enneagram figure's first definitely established use (at least in its most common form of the triangle and hexagon) is found in the writings of the Greek-Armenian spiritual teacher G.I. Gurdjieff and his Russian-born student, P. D. Ouspensky. The teaching tradition established by Gurdjieff and Ouspensky is called "the Fourth Way." The figure's use for a typological model is first clearly found in the teachings of Bolivian-born Oscar Ichazo and his system called "Protoanalysis." Much of popular Enneagram teaching has, however, been principally developed from the teachings of the Chilean-born psychiatrist Claudio Naranjo who first learned the basics of the Enneagram from Ichazo. It was principally from Naranjo that the Enneagram became established in the United States. His Enneagram teaching was further developed by many others teachers including a number of Jesuit priests and seminarians at Loyola University in Chicago. Contemporary ways of understanding and describing the "Enneagram of Personality," as it is sometimes called, have developed from various traditions of spiritual wisdom and modern psychological insight. While many people understand the Enneagram principally in spiritual or mystical ways others understand it primarily in psychological terms. The nine Enneagram types are often given names that indicate some distinctive behavioral aspect, though these labels are insufficient to capture the nuances of the type concerned. Some examples are as follows. The corresponding unhealthy aspect is indicated in square brackets. One: Reformer, Critic, Perfectionist [Anger]. This type focuses on integrity. Ones can be wise, discerning, and inspiring in their quest for the truth. They also tend to dissociate themselves from their flaws and can become hypocritical and hyper-critical, seeking the illusion of virtue to hide their own vices. The One's greatest fear is to be flawed and their ultimate goal is perfection. Two: Helper, Giver, Caretaker [Pride]. Twos, at their best, are compassionate, thoughtful and astonishingly generous; they can also be prone to passive-aggressive behavior, clinginess, and manipulation. Twos want, above all, to be loved and needed and fear being unworthy of love. Three: Achiever, Performer, Succeeder [Deceit]. Highly adaptable and changeable. Some walk the world with confidence and unstinting authenticity; others wear a series of public masks, acting the way they think will bring them approval and losing track of their true self. Threes fear being worthless and strive to be worthwhile. Four: Romantic, Individualist, Artist [Envy]. Driven by a fear that they have no identity or personal significance, Fours embrace individualism and are often profoundly creative. However, they have a habit of withdrawing to internalize, searching desperately inside themselves for something they never find and creating a spiral of depression. The stereotypical angst-ridden musician or tortured artist is often a stereotypical Four. Five: Observer, Thinker, Investigator [Avarice]. Believing they are only worth what they contribute, Fives have learned to withdraw, to watch with keen eyes and speak only when they can shake the world with their observations. Sometimes they do just that. Sometimes, instead, they withdraw from the world, becoming reclusive hermits and fending off social contact with abrasive cynicism. Fives fear incompetence or uselessness and want to be capable above all else. Six: Loyalist, Devil's Advocate, Defender [Fear]. Sixes long for stability above all else. They exhibit unwavering loyalty and responsibility, but are prone to extreme anxiety and passive-aggressive behavior. Their greatest fear is to lack support and guidance. Seven: Enthusiast, Adventurer, Materialist [Gluttony]. Eternal "Peter Pans," Sevens flit from one activity to another. Above all they fear being unable to provide for themselves. At their best they embrace life for its varied joys and wonders and truly live in the moment; but at their worst they dash frantically from one new experience to another, being too scared of disappointment to enjoy what they have. Eight: Leader, Protector, Challenger [Lust]. Eights worry about self-protection and control. Natural leaders, capable and passionate, but also manipulative, ruthless, and willing to destroy anything and everything in their way. Eights seek control over their own life and their own destiny and fear being harmed or controlled by others. Nine: Mediator, Peacemaker, Preservationist [Sloth]. Nines are ruled by their empathy. At their best they are perceptive, receptive, gentle, calming, and at peace with the world. On the other hand, they prefer to dissociate from conflicts and indifferently go along with others' wishes or simply withdraw, acting via inaction. They fear the conflict caused by their ability to simultaneously understand opposing points of view and seek peace of mind above all else. 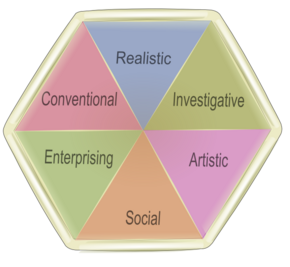 These four dimensions can be grouped in a grid with D and I sharing the top row and representing extroverted aspects of the personality, and C and S below representing introverted aspects. D and C then share the left column and represent task-focused aspects, and I and S share the right column and represent social aspects. In this matrix, the vertical dimension represents a factor of "Assertive" or "Passive", while the horizontal dimension represents "Open" vs. "Guarded". The DISC Profile is a self-scored assessment, available in a traditional paper workbook format and online versions. In 1981, at a symposium in Honolulu, four prominent researchers (Lewis Goldberg, Naomi Takamoto-Chock, Andrew Comrey, and John M. Digman) reviewed the available personality tests of the day, and decided that most of the tests which held any promise seemed to measure a subset of five common factors. These five factors correspond to those generated in 1963 by W.T. Norman, based on lexical analysis of the English language by Gordon Allport and H. S. Odbert in 1936. Neuroticism: A tendency to easily experience unpleasant emotions such as anxiety, anger, or depression. I change my mood a lot. Extroversion: Energy and the tendency to seek stimulation and the company of others. Agreeableness: A tendency to be compassionate and cooperative rather than suspicious and antagonistic towards others. Conscientiousness: A tendency to show self-discipline, act dutifully, and aim for achievement. I am exacting in my work. Openness to experience: Appreciation for art, emotion, adventure, and unusual ideas; imaginative and curious. I have a rich vocabulary. This model is widely used in vocational counseling and is a circumplex model where the six types are represented as a hexagon in which adjacent types are more closely related than those more distant. Some cognitive psychologists have dismissed the idea of personality, believing most behavior is context specific. These theorists developed the concept of cognitive styles or "Meta-programs" to deal with this, which in turn lead to meta-program tests such as the Inventory for Work Attitude & Motivation (iWAM). Other tests include the Oxford Capacity Analysis, Millon Clinical Multiaxial Inventory, Eysenck's three-factor Personality Questionnaire, and the Abika Test. A significant number of businesses use personality testing as part of their hiring process. More and more people are also using personality testing to evaluate their business partners and potential spouses. Salespeople use personality testing to better understand the needs of their customers and gain a competitive edge in closing sales. Guidance counselors use personality tests to help students make appropriate career choices. Lawyers use personality testing for criminal behavior analysis, litigation profiling, witness examination and jury selection. While none of the tests available may give complete assessments, it has been possible to tailor particular tests to the specific needs of employers, the military, lawyers, and so forth. This can be beneficial by providing a better fit between the person and what they will be called on to accomplish. 1990. "Congress of the United States Office of Technology Assessment" in The Use of Integrity Tests for Pre-Employment Screening. OTA-SET-442 NTIS order #PB91-107011. Almaas, A. H. 2000. Facets Of Unity: The Enneagram Of Holy Ideas. Shambhala Books. ISBN 0936713143. Baron, Renee, and Elizabeth Wagele. 1994, The Enneagram Made Easy. ISBN 0062510266. Berens, Linda V., Cooper, Sue A., Ernst, Linda K., Martin, Charles R., Myers, Steve, Nardi, Dario, Pearman, Roger R., Segal, Marci, and Smith, Melissa A. 2002. Quick Guide to the 16 Personality Types in Organizations: Understanding Personality Differences in the Workplace. Telos Publications. ISBN 978-0971214415. Berens, Linda V., and Dario Nardi. 1999. The 16 Personality Types: Descriptions for Self-Discovery Radiance House. ISBN 978-0979868429. Carroll, Robert Todd. 2004. "Myers-Briggs Type Indicator®" in The Skeptic's Dictionary. Retrieved March 4, 2019. Conn, Steven R. 1994. Sixteen Pf Fifth Edition Technical Manual. Institute for Personality & Ability Testing. ISBN 0918296226. Georgia State University. GSU Master Teacher Program: On Learning Styles. Retrieved March 4, 2019. Holland, John L. 1997. Making Vocational Choices: A Theory of Vocational Personalities and Work Environments. Psychological Assessment Resources Inc. ISBN 978-0911907278. Jung, Carl Gustav. 1971. Psychological Types (Collected Works of C.G. Jung, Volume 6). Princeton University Press. ISBN 0691097704. Jung, Carl Gustav. 1989. Memories, Dreams, Reflections. New York, NY: Vintage Books. ISBN 978-0679723950. Keirsey, David. 1998. Please Understand Me II: Temperament, Character, Intelligence. Prometheus Nemesis Book Co. Inc. ISBN 1885705026. Marston, William Moulton. 2007. Emotions of Normal People. Cooper Press. ISBN 978-1406701166. Martin, Charles. 2004. The Sixteen Types at a Glance. The Center for Applications of Psychological Type. Retrieved April 2, 2011. Myers, Isabel Briggs. 1995. Gifts Differing: Understanding Personality Type. Davies-Black Publishing. ISBN 089106074X. Myers, Isabel Briggs, Mary H. McCaulley, Naomi L. Quenk, and Allen L. Hammer. 1998. MBTI Manual (A guide to the development and use of the Myers Briggs type indicator), 3rd ed. Consulting Psychologists Press, ISBN 0891061304. Palmer, Helen. 1991. The Enneagram: Understanding Yourself and the Others In Your Life. HarperOne. ISBN 0062506838. Palmer, Helen. 1996. The Enneagram in Love and Work: Understanding Your Intimate and Business Relationships. HarperOne. ISBN 0062507214. Paul, A.M. 2004. The Cult of Personality: How Personality Tests Are Leading Us to Miseducate Our Children, Mismanage Our Companies, and Misunderstand Ourselves. Free Press. ISBN 0743243560. The Center for Applications of Psychological Type. 2004. MBTI® Code of Ethics. Retrieved March 4, 2019. University of Florida. 2003. Guide to the Isabel Briggs Myers Papers 1885-1992. George A. Smathers Libraries, Department of Special and Area Studies Collections, Gainesville, FL. Retrieved March 4, 2019. All links retrieved March 4, 2019. 4Temperaments.com The Web Site for Understanding the Four Temperaments. The Personality Project Good source of references for further reading. This page was last modified on 4 March 2019, at 22:15.